1) Decide on which photo you would like to be the main focus of your layout. You can match the colours of your photo with the patterned paper or choose a few colours to repeat throughout the layout. 2) Crop your photo to a square shape using editing software, I load my photos onto Instagram but most photo editing software will have the option to crop into a square. When printing these off make sure you un-tick the fit to page option otherwise the printing program will stretch the image. 3) Using the Stamp nesting dies and the Leyton doily paper, cut out the largest one as this will fit a 4x4 photo comfortably. Fit your photo into the centre of this shape. Put to one side for now. TIP: Make sure that any adhesives and paper that is in direct contact with the photo is acid-free. This is to prevent damage to the photo. 4) Using the shield die from the Tiny Tatty ted plane set, cut out two shields, I used the starfish paper and the wavy stripe from sail Away. Trim the top off so that you are left with the curvy part. 5) Take an 8x8 sheet of patterned pebble paper and add texture by either trimming around the edges with fancy edged scissors or a border punch. Ink around the edges, leave to dry and turn it over. On the back we are going to adhere the two curved shapes at opposite corners of the square before sticking the whole section to the centre of the layout. 6) Cut a large 11x18cm rectangle in the wavy stripe paper and another shield frame out of the colourful starfish paper, cut the top off the shield and keep the curved part at the bottom. Adhere this part under the rectangle and adhere to the edge of the 8x8 square. 7) Place the matted photo on the edge of the rectangle to complete the layers. 8) There are a variety of embellishments available and you may find it easier to stick to using the ones that match the papers. I have used blossoms, buttons and wooden shapes but also added interest with shells collected on my trip. TIP: Group the embellishments into odd numbers such as in 3s and 5s as this is visually pleasing to the eye. 9) Place the groups of embellishments in three different areas on the layout to form a rough triangle. This draws the eye into the centre of the layout and again is more visually pleasing. 10) Finish off the layout with a title. I used alphabet die cuts instead of stickers as you can cut out as many letters as you need. Using stickers you eventually run out of vowels but you can mix up the leftover stickers to create an interesting mixture of fonts and colours. Katie’s tutorial is perfect for crafter’s thinking of getting into scrapbooking and features some great tips. 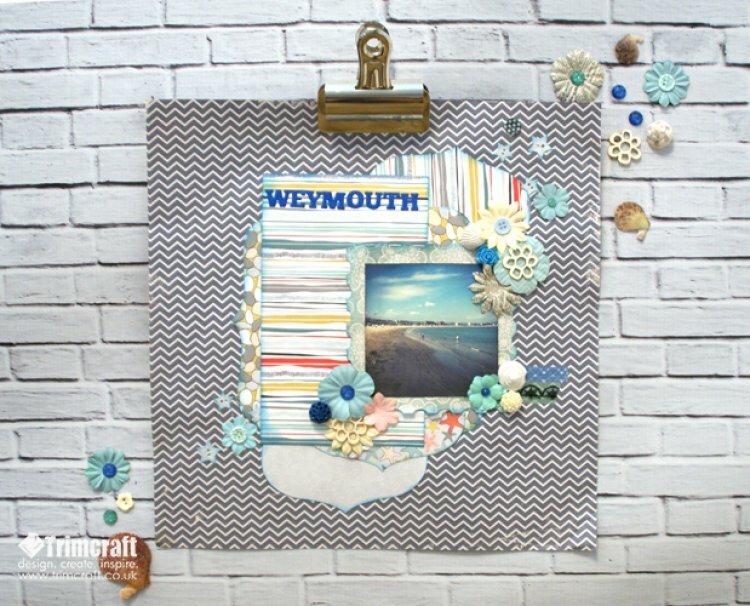 Scrapbooking is about being creative and trying new things so have fun mixing up your designs and adding your unique touch. Share your scrapbooking makes with us in the Project Gallery.